An abandoned shopping mall situated in the middle of nowhere. There is nobody around except for you and a group of fearless friends and you are sure you heard someone scream. Now, you and your friends need check to see what’s going on inside – but keep a close eye on them… you are not in there alone. There may be Zombies lurking around. Put together your team of survivors and jump into a 250,000 sqft abandoned shopping precinct in this personal, customisable experience. 2+ Hours of Immersive theatre, gore and action like no other. Movie quality special effects, areas full of character and the exclusive Zed Events weaponry! Voted “Best UK Zombie Experience” at the 2016 ScareCon Awards! Seen by over 70 Million people worldwide in 2016. Winner of ScareCon’s 2016 “UK Best Zombie Experience” you’ll be placed at the heart of the virus outbreak at the world renounced Centesis pharmaceutical facility in The Mall, Reading. Previously an iconic 250,000 square foot abandoned shopping precinct across 6 levels, full of character just like a set piece from The Walking Dead. However, not all is as it appears! Behind certain doors, The Centesis Pharmaceutical Company have been conducting their revolutionary biological experiments with devastating side effects! As soon as you enter through the doors you must keep your wits about you! You’ll need to read between the lines as you interact with the Centesis senior medical staff before the facility enters a shocking lockdown procedure! Then it’s down to you and your team to arm up with what you can, take down the infected Centesis patients and save the world from the apocalypse! Since January 2016, this experience delivered a completely revised storyline with truly shocking twists, incredible action, and immersive theatre! It’s had consistent 5* reviews on Facebook, over 70 MILLION views around the world through channels such as the LADbible and YouTube and continues to go that extra mile with its attention to detail, quality and special effects. With new elements being added all the time such as props by Oscar-winning Special Makeup Effects company Collier Creatures (WWZ, Pride & Prejudice with Zombies), this experience is as adrenaline fuelled as you can get! You will be armed with a firearm that looks, feels and fires as close to a real firearm as you can legally get without the need for eye protection. This is the first experience of its kind that allows head shots. Not paintball, laser tag or airsoft but something completely unique. You will literally feel the blast when you pull the trigger as you place that perfectly aimed headshot onto an attacking Zombie! It’s two hours of adrenaline fuelled action no different than a Hollywood blockbuster! 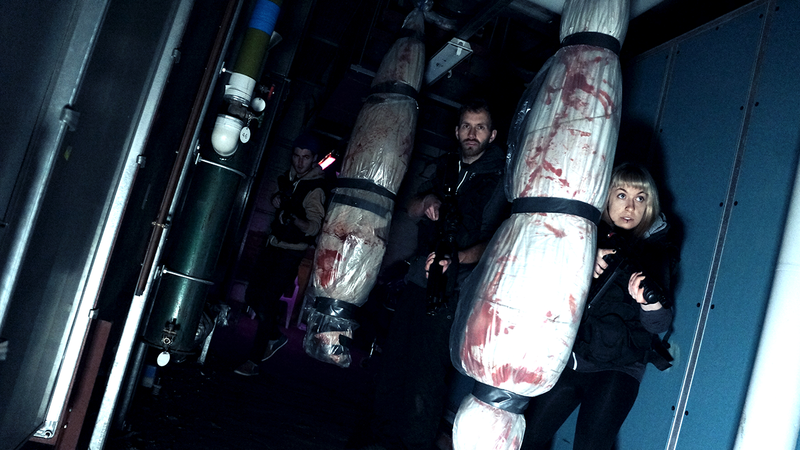 You and your hardy group of zombie survivalists will need to track the walkers up and down the mean escalators, exploring new and risky areas of the mall such as an armoury, morgue and laboratories! Don’t miss out on the UK’s “Best Zombie Experience 2016” voted for at the ScareCon awards! This truly is an incredible full immersion zombie battering experience at The Mall, Reading. 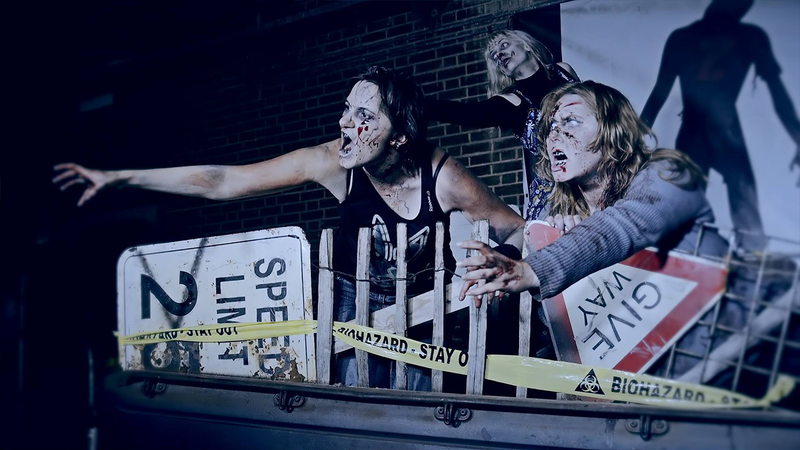 Cornucopia™ is proud to be the only exclusive supplier of the only zombie experience in the world, where you and your friends have exclusive full access to the abandoned shopping mall to battle zombies. No one will be around to hear your screams, so suit up and fight for your life!